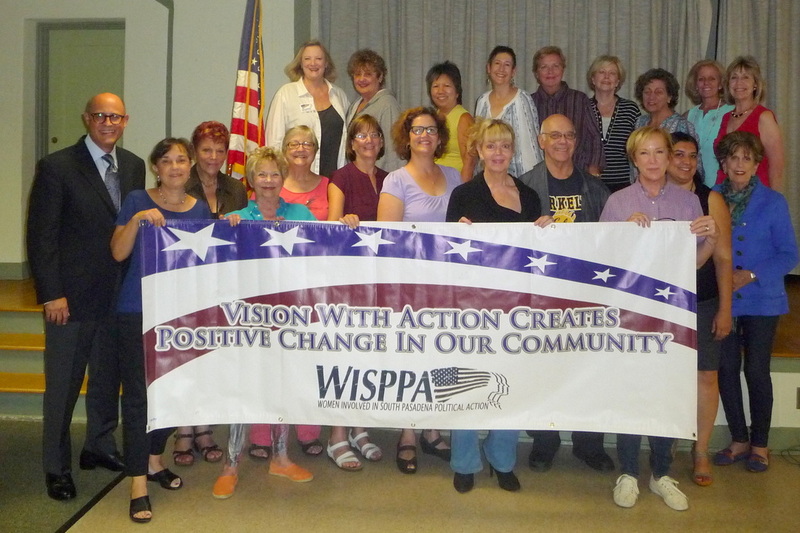 WISPPA's purpose is to push for accountability, integrity, and transparency in South Pasadena government, and to actively encourage strong, well-qualified candidates, and especially women, to run for City Council and to serve on City Commissions. WISPPA also seeks to offer opinions and advocate for positions concerning the well-being of the City of South Pasadena, and to provide information to the electorate regarding City Council candidates and city issues. ﻿Go to our Facebook page and "like us"! ​Meeting beings at 9:30 a.m.
​We started as a women’s group, but everyone is welcome to join Your dues help strengthen an organization that is committed to transparency in the political workings of South Pasadena. When we speak as a group on issues of local importance, local and state officials listen. ​​If you are a resident of South Pasadena or nearby areas who likes to be “in the know” about issues of local importance, you have come to the right place. We are a group of about 80 concerned citizens who work to keep our city informed about local politics and other matters that affect our daily lives—from development, to schools, streets and infrastructure projects, public safety, and, of course, the 710 Freeway. Among our members are many elected officials, artists, influencers, educators, parent activists and business owners who are committed to working together to keep South Pasadena a great place to live. Sometimes this means taking on state legislation such as the loophole for massage parlors that we helped close. Sometimes it just means informing as many people as possible about what is coming up at a City Council meeting, or digging into the background of a long-simmering construction project. We are nonpartisan but definitely not uninvolved. Our monthly Saturday meetings are part coffee klatch and part political salon where we get to ask questions of movers and shakers who are integral to what is happening in our city right now. Whether it is the police chief, planning director, a developer, or the new president of the Huntington Library and Gardens, we get the inside scoop. Although, we don’t endorse particular candidates, we believe in an informed and engaged electorate. We encourage qualified candidates, especially women, to develop their leadership skills and run for office. To that end, we publish up-to-date information about openings on city commissions and promote election forums. We also collaborate with and promote local groups that are making a difference in South Pasadena, such as Vecinos, Chinese American Club and Urban Harvester. Lastly, we also keep a finger on the pulse of what is happening in town with a comprehensive calendar & events list, important city information and website links, issues page, etc.